How does an artist go from “creative blockage” to CREATIVELY FABULOUS? This is a really good question! Through my experience, everyone obtains creative inspiration through completely different methods. In 2011, I started my MarketArtist blog and it began with the EXACT SAME TOPIC! I was in a massive “imaginative funk” and needed a tremendous amount of inspiration. Technically, my main career path is in the Creative Marketing industry. Secondarily, I’m a watercolor fine artist and teacher. Certainly, if I created a blog I could use my marketing talents to help other artists and designers; in-turn, help myself in the process. As a result I obtained one goal and helped other people, but not myself. I tried everything I blogged about and touted. Co, I remained in the same situation. I practiced what I preached and put forth my college effort. I set timers to focus on my art and experimented various media. I wrote in a journal, sketched, and photographed things that might inspire me. Consequently, I produced nothing of substance. For myself, I was going about things the wrong way to INSPIRE ME. I began a soul searching quest for a three-year period and was blessed to have someone to work through my thoughts and ideas. In addition, our family moved to a home in the country. I wasn’t organized, hadn’t gotten my studio set-up, and was trying to adjust to an enormous life change – simplicity. Yes, simplicity can be a big adjustment. After a chaotic move in the fall, things got better. I created a new studio space and lived at a slower pace. Never quite realizing that I actually needed something substantial – A MAJOR CHANGE. Once spring rolled around and on to summer, life really transformed. Finally, I started to find myself. Through where we lived, our friends, our children, and most of all through my amazing husband. All of these miraculous things helped ME find my wings again. One afternoon, while shopping at the home improvement store, my husband pointed out a hummingbird feeder. He always had hummingbird feeders at his parents’ home. That day, we got one. I researched online how to make hummingbird food and whipped up a batch, filled the feeder, and patiently waited. Furthermore, I had the impression it takes time for a hummingbird to find a feeder. Honestly, that was it for me! Creative inspiration hit like a ton of bricks. I observed, studied hummingbird anatomy, and took a million pictures. In addition, I continually made sure our hummingbird always had fresh sweet food. One morning, I went out to clean the feeder. While I fiddled with the hook, our hummingbird buzzed down like a tiny helicopter and stared me in the eyes. I was a little startled and realized it was a female. I had read they were quite the territorial creatures. Pecking my eyes out was not my concern, but we had a sure-fire standoff. After the incident, I named her “Lucy.” Creative inspiration boiled-up in my soul. I HAD TO PAINT! 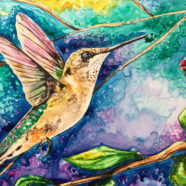 Having never painted a bird before, I felt like the universe granted me back my creative “mojo.” This is how the “Wings of Inspiration” series started. “Lucy” was my first work in a line of continuously flowing watercolor paintings. My moral to this story is you cannot force creativity. It is difficult to bring yourself out of a “creative block” if you don’t haveany inspiration. CREATIVITY JUST HAPPENS! In conclusion, looking back at my old blogs, I am pretty sure I need to update content. Seeing that the universe, my family, friends, and a little bitty named “Lucy” brought back my Wings of Inspiration. Working in the marketing communications industry for over 15+ years, provides a strategic insight into (BTB) and (BTC) marketing environments. It creates a balance with my passion – ART! My vision and goal is to deliver joy, knowledge, and mentor individuals within the artist and marketing professions. Follow Marie R. (Stonestreet) Broyer on social media to find out the latest information and posts. All designs and artwork are created and are under a copyright © Marie R. Stonestreet. All Rights Reserved. Usage of any image or design within this site is unauthorized without the permission of Marie R. Stonestreet. My vision is to provide knowledge and mentor individuals within the artist and marketing professions. I create community artistic inspiration while uniting strategic communications for artists & businesses.